Home › climate › Are We There Yet? …that in Russia, spring and fall were the worst times of year for travel, and that the best time was not summer, but winter? Most of the territory of Russia was (er, still is, actually) very rich in rivers. With a rather wet climate (heavy snowfall, abundant rain), it was muddy, marshy and boggy for a good part of the year. Spring with its run-off from the melting snow made it impossible to travel by land, and the breaking-up of the ice made it too dangerous to navigate the rivers. Fall, with its rainfall, was also too muddy. The short summer was devoted to planting and harvesting and preparing for the long, harsh, and mostly dark winter. And yet, the very rivers that flooded regularly and made land impassable were the highways of medieval Russia. Trade routes through Russia followed the rivers, with relatively short portages from one to another. From the Baltic sea to Byzantium, the famed trade route “From the Varangians to the Greeks” consisted of a series of rivers. Pirates were not unknown in the generally land-locked Russia (or rather, ice-locked, for most of the seas are Arctic seas); they were river pirates, as feared and reviled as any Caribbe an sea dog. In the winter, it was still the rivers, now frozen for many long months, that offered their hardened surfaces to the merchants, warriors, and other travelers. While the heavily forested land was covered in deep snowdrifts that made it all but impassable, the wide rivers would be swept free of snow by the winds, and travelers rode in sleighs wherever need took them. 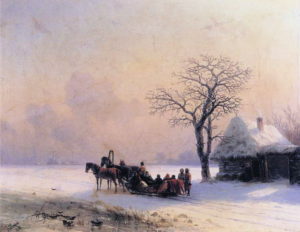 Thus in Novgorod, among the myriad medieval artifacts, no cart, carriage or wagon wheels were discovered, but sleigh runners, on the other hand, are a common find in excavations. So now you can imagine yourself sitting in a sleigh, covered by a mound of furs, pulled quickly along a frozen river, to the jingling of harness bells… But not by a troika (three horses abreast) pulling the sleigh — that is a later invention.